Patrick is an editor at MAKE. He is the author of the books Environmental Monitoring with Arduino, Atmospheric Monitoring with Arduino, The Science of Battlestar Galactica, and This is What You Just Put In Your Mouth. He has sworn to defend mankind against the eventual rise of the killer bots. 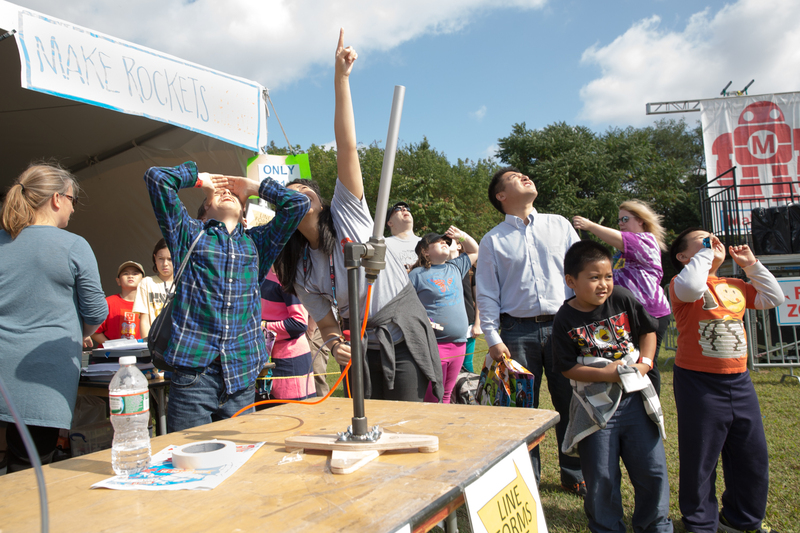 It’s a bird, it’s a plane, it’s a homemade air-compressed rocket! Maker Faire’s Minister of Information Tami Jo Benson is a big fan of the parallels between the 1964 World’s Fair and the 2014 Maker Faire. 1) Imagine yourself an astronaut: Find the Project Gemini and Project Mercury rockets. “I love coming in on the train and seeing those rockets bursting out of the trees!” For extra credit, count how many full-sized Mercury space capsules (either real ones, or re-creations) you can find on the grounds. 4) Find a poetic vehicle with haikus, limericks, couplets, and free verse. And you can even leave your own once you find it. 6) You’ll hear music all over Maker Faire, but where can you make it with anything? “I love that Makers are creatively thinking about the intersection of electronics and exploring lots of ways to make music.” Hint: that’s a hint. 7) Wave hello to a 3D-printed hand. 8) Snap a pic with Makey & Share #MakerFaire “He gives good hugs!” Hint: He’s red!